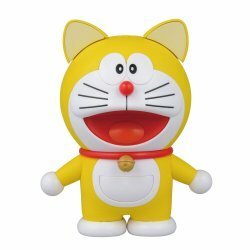 "Original Doraemon" line-up to figure-rise Mechanics! * Reproducing the yellow body in the molded color, the characteristic ears of the original Doraemon are reproduced with new shaping. * Seal less realized by making mouth a separate part. It became easier to make! * Clear parts exterior attachment, internal mecha..
* Clear parts exterior attachment, internal mechanism is circled! * "Take copter" is included! It also comes with attachment parts for chopsticks that can be attached to "Figure-rise Mechanics Doraemon" sold separately.